Spring has finally sprung, and I could not be more excited, as my family and I are notorious for hosting Sunday barbecues (with an Italian twist). 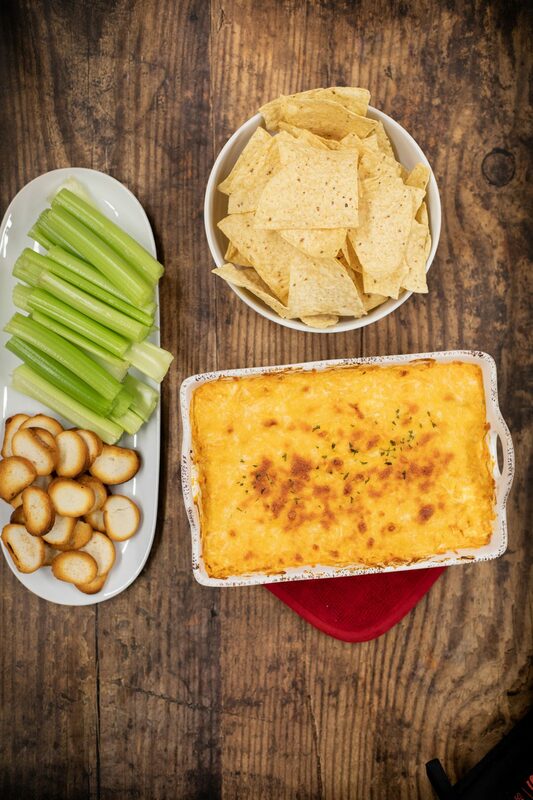 Today, my team and I are thrilled to share with you a mouthwatering recipe for buffalo chicken dip made to perfection in the Sharp Superheated Steam Countertop Oven. 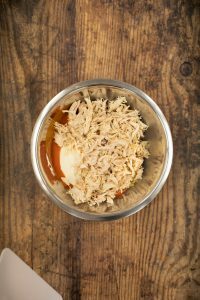 This recipe is a modern take on a classic recipe that features chicken, buffalo sauce, cream cheese, and of course, loads of cheese. The great thing about buffalo chicken dip is that you get all the flavors of buffalo chicken wings without the huge mess. All things aside, there is no mess free way to eat a chicken wing that I’m aware of. Everything starts out fine, while you are casually and neatly nibbling on your chicken wing. Then, somehow it always ends the same, and your entire face and clothes are covered in sauce while your entire family is wondering how you never learned how to properly eat after all these years. Usually, you’re either a blue cheese kind of person or a ranch enthusiast. There is no in-between. 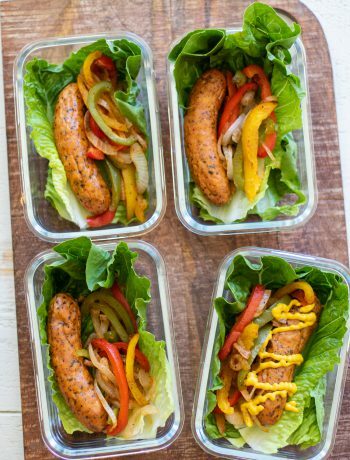 I personally love to add ranch to all my veggies and barbecue dishes. Luckily for this recipe, you can use ranch or blue cheese interchangeably. You’ll want to start off by coating the included broiling pan evenly with 1 tablespoon of olive oil and set it aside for later. 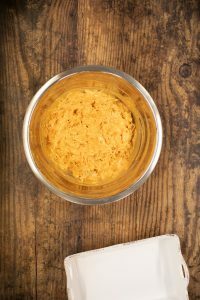 Some buffalo chicken dip recipes call for canned chicken, as opposed to fresh. If you ask me, you can absolutely taste the difference between the two. With that in mind, we decided to use fresh chicken breasts coated with 1 tablespoon of olive oil, salt, and pepper. We placed two medium chicken breasts on the coated broiling pan and cooked in the Superheated Steam Countertop Oven on Broil/Grill for 16-18 minutes or until your desired doneness. If you’re not a fan of canned chicken, but don’t have time before guests arrive to make your own chicken breasts, consider purchasing a rotisserie chicken. With this option, you’ll still have that zest of fresh flavor without the hassle or the mess that comes with it. If you are using a Sharp European Convection Built-in Wall Oven instead of the countertop steam oven, preheat the oven to 485ºF, and bake the chicken breasts for 16-18 minutes or until your desired doneness. While your chicken breasts are in the oven, place your cream cheese on a microwave safe dish and soften in the microwave for about 1 minute. If you are using a Sharp Carousel Countertop Microwave Oven, place the dish in the microwave oven and select Setting 4 of the Melt/Soften feature. 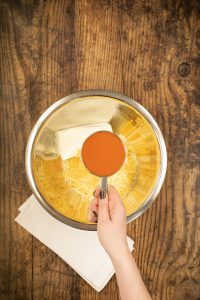 Once the cream cheese is soft, place in a medium bowl and add the shredded cheese, buffalo sauce, and the blue cheese or ranch. 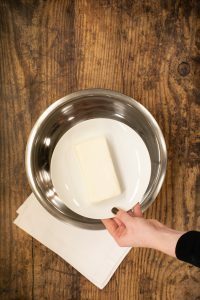 You need to mix the ingredients well by folding the mixture with a baking spoon for about 4 minutes or until smooth. Once the chicken breasts are finished cooking, remove from oven and allow 5-10 minutes for chicken breasts to cool. 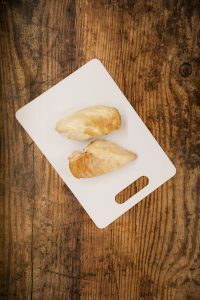 Once the chicken breasts are at room temperature, shred each chicken breast into bite sized pieces (use your best judgement now) by pulling the chicken breast apart with two forks. 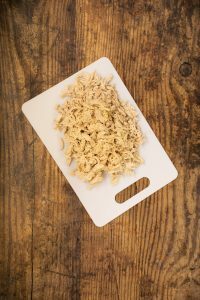 Shredding your chicken, instead of dicing it into cubes, is an excellent way to make sure the chicken is evenly distributed throughout the dip and can be easily scooped. Once your chicken breasts are shredded to an appropriate size, add to the dip mixture and fold for about two minutes or until the dip batter looks smooth. 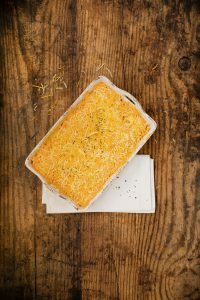 You’ll want to gather a shallow 1 quart ceramic baking dish to pour your dip into. This dish does not need to be coated with olive oil nor cooking spray. 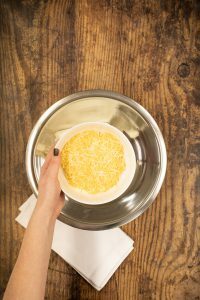 Once your dip is evenly poured into the dish, top off the pan by spreading the remaining shredded cheese on top. 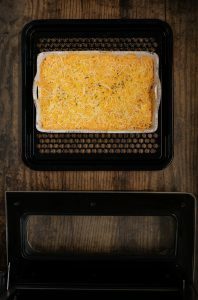 Place baking dish in the Superheated Steam Countertop Oven and set on Bake/Reheat at 350ºF for 15 minutes or until light brown color appears along the top. When you’re setting the table, make sure to arrange your celery, chips, and baguette slices around the dip. I also set aside a spoon next to my dip to encourage friends and family NOT to be a double dipper. If you’re a huge veggie fan, consider adding carrots, broccoli, or cauliflower to your serving tray as well. After all, what doesn’t taste good with buffalo chicken dip? As a recipe tip, sprinkle paprika or cayenne pepper over finished dish to add a zest of flavor. 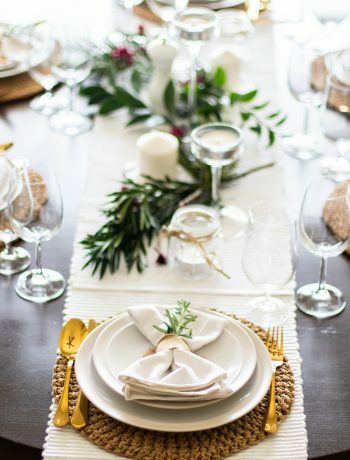 You can also use a stencil during the holiday season to add a festive spark to the tray. Coat your broiling pan evenly with 1 tbsp of olive oil. Then set aside. Prepare chicken breasts coating each breast with 1 tbsp of olive oil, salt, and pepper over a large tray. Place both medium chicken breasts on the coated broiling pan. In the Sharp Superheated Steam Countertop Oven, set the oven to the Broil/Grill setting, and bake for 16-18 minutes or until your desired doneness. In a European Convection Built-in Wall Oven, preheat the oven to 485ºF, and bake the chicken breasts for 16-18 minutes or until your desired doneness. While your chicken breasts are cooking, place cream cheese on a microwave safe dish. Soften cream cheese in your Sharp Carousel Countertop Microwave Oven on Setting 4 of the Melt/Soften feature. In a bowl combine shredded cheese, buffalo sauce, blue cheese /ranch, and softened cream cheese. 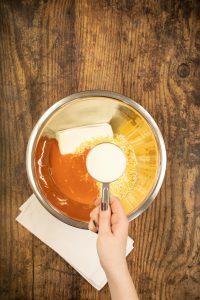 Mix ingredients well by folding the mixture with a baking spoon. Once the chicken breasts are finished cooking, remove from oven and allow 5-10 minutes for chicken breast to cool. Shred each chicken breast into bite sized pieces by pulling apart with two forks . Then gently mix into ingredients listed in step 7. 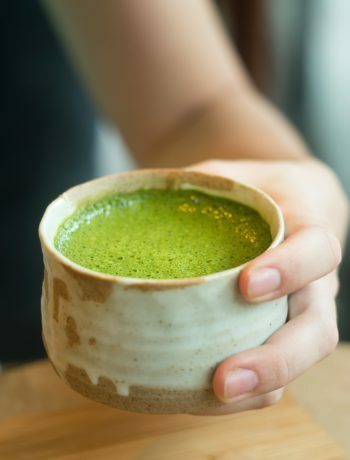 Pour mixture into a shallow 1 qt. ceramic baking dish. This dish does not need to be coated with olive oil nor cooking spray. Top off your dish by evenly spreading the remaining shredded cheese on top of pan. Place baking dish in the Superheated Steam Countertop Oven, and set on Bake/Reheat at 350 degrees for 15 minutes or until light brown color appears. Arrange your celery, chips, and baguette slices to enjoy your Hot Buffalo Chicken Dip!